From a Howell Mountain estate, Robert Craig produces wines that explore the depth and breadth of Napa Valley’s mountain appellations: Howell Mountain, Spring Mountain, Mount Veeder, and Diamond Mountain. These mountains sites yield low volumes of concentrated, highly-prized fruit with small berries. Bob Craig is one of Napa’s legacy mountain Cab growers. He started farming on Mount Veeder in the late 1970’s, and went on to help establish the Mount Veeder and Spring Mountain AVAs. Since his first vintage in 1992, Cabernet Sauvignon has been the backbone of the portfolio. Today, that selection of award-winning Cabernet is complemented by limited bottlings of Zinfandel, Merlot, Chardonnay, and Rosé. Craig has eased into semi-retirement, having passed the reins to winemaker Stephen Tebb and long-time vineyard manager Carlos Mendez. These are wines of character that express specific appellations, as opposed to a sweeping expression of Napa Valley as a whole. Naturally, it’s an approach that starts in the vineyard. Craig’s winemaking philosophy is simple: wine should be made with minimal intervention so that vineyard qualities are displayed in the finished wine. 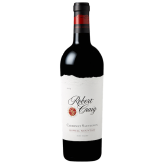 At it’s best, mountain Cabernet is concentrated and intense, with high acidity and tannins. The polish and elegance of Craig’s wines comes from care and gentle handling in the vineyard and at the winery. Each vineyard block is monitored as harvest approaches to assure the proper degree of ripeness, and grapes are picked in small lots. These small lots are handled separately through fermentation, each developing a unique identity. The finished wine is bottled unfined and unfiltered. It’s an approach that has paid dividends: high scores that just keep rising and consistently age-worthy vintages.